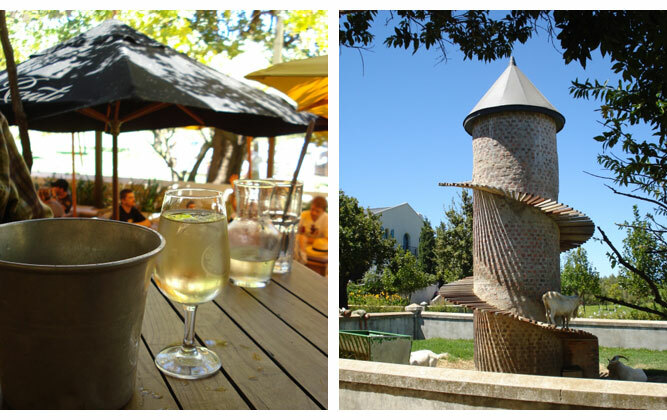 Lunch at Fairview: The temptation to play with the word ‘fair’ when applied to Fairview Wine Estate is great – it more than lives up to its name. 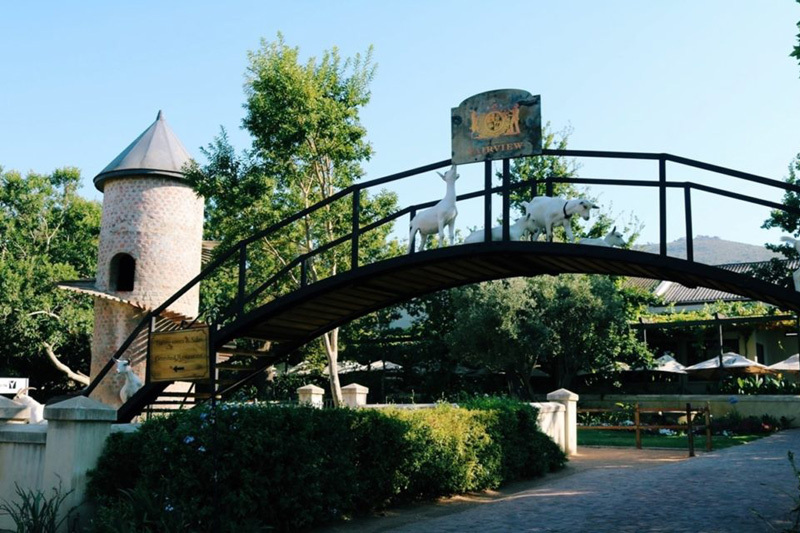 The Wine and Cheese farm, just off Suid-Agter Paarl Road, lies in one of the ‘fairest’ settings possible, set behind Paarl‘s ubiquitous ‘rock’, its parking area littered with pretty, shady trees and its entrance utterly dominated by a fairly ingenious tower complete with spiral staircase, featuring three of their Swiss Saanen goats – that looked very much the way I felt, considering it was probably 40 degrees in the shade, of which there was not much in their domain. The Goatshed, Fairview’s slightly upmarket barn-style/foodhall restaurant touting Mediterranean ‘fare’ (couldn’t resist) and a chance to sample up to twenty five of the farm’s predominantly goats’ cheeses, together with their wines, is extremely popular. It was just as well we had booked a table as when we arrived, just before 1pm, the place was literally humming. Outside, the grapevine smothered balcony below, and the slightly cooler bluegum latte-roofed verandah offered a further smattering of tables, which, provided there is a breeze, are wonderful to sit at – beautiful lawns and a trickling stream and water features. There was evidence of ice buckets on virtually every table, as people drank copious amounts, not always water, and the shouts of children dipping themselves in the little stream beyond our tables added further still to the sense of balmy days, good food and little else to do. The Goatshed has got the ‘food experience’ combination right. One isn’t there purely for the menu, but for the experience whilst eating the food that makes it taste all the finer for the surrounding combination of beautiful views and alfresco dining experience. It’s no surprise that the food is good as the former owner of the Mimosa Lodge in Montagu, Andreas Küng, a qualified architect who had a change of heart due to his love of food, is the chef. 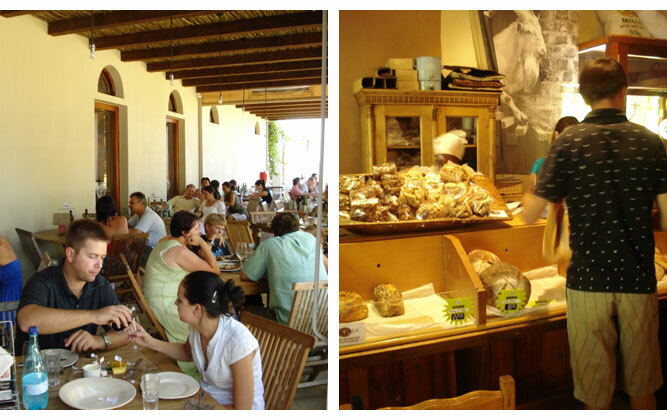 The restaurant also employs rougly 25 formerly unemployed people from the surrounding winelands as bakers, waiters and wine stewards. And the food was good. Nothing fancy or intimidating, although there were a selection of cleverly combined salads and bistro meals that work perfectly for lazy summer Sundays – farm salad that combines roasted vegetables, cherry tomatoes and toasted seeds, smoked trout salad, beef fillet carpaccio with toasted pine nuts, gruyère shavings and more, duck liver paté, warm stir-fried springbok, beef biltong salad, a chicken pie, ostrich medallions, line fish, pork spare ribs, lamb curry, beef fillet and on and on…. We settled for the smoked snoek salad, a truly heavenly combination of celery, red onions, green apples, white grapes, turmeric potatoes and snoek tossed together in a light yoghurt, lemon juice and olive oil dressing, served with moskonfyt that gave it a wonderful flavour; a couple of paninis (made on the premises; a truly unique version of the usual doughy white bread) served with pesto, roasted vegetables and grated farmhouse cheddar and a cheese platter to share. There was enough food to feed an army, the decadence was enormously pleasing, and the combination of the food wonderful. The cheese platter arrived with a generous portion of sliced bread, and our little one was brought even more farmhouse bread of his own to have with grated cheese and butter – kiddie heaven (and they charged us virtually nothing for his meal, which may have been an oversight, but I felt was incredibly generous). Cheese included camembert, brie, bleu en blanc, blue rock (a particularly creamy roquefort), white rock with cranberry (my personal favourite), cream cheese with black pepper, cream cheese with sweet chilli (another num version) and crottin. Cheese platters come in 8 choice, 10 choice, and I think 12 choice, platters and are a must when there for any meal. Fairview’s popular Goats do Roam wines are served in 200ml carafes or by the bottle, and, provided you don’t manage to upend most of the wine onto the floor as we did, are thoroughly enjoyable. The restaurant does special group breakfast set menus, and gives early bird bikers and cyclists a 15% discount on breakfast – you have only to produce your helmet as evidence of having made it out there! There is also a deli corner that offers a stream of sliced cured meats, preserves, jams, chutneys, nougat, goats’ milk fudge, and of course, cheese by the kilogram (although you don’t really score by buying from the farm as the price is only just lower than what you would pay in your local supermarket). We rounded off the wonderful meal with a scoop of the most creamy, homemade blueberry ice cream with a piece of shortbread, and a couple of cappuccinos. The Goatshed claims the best coffee in the Cape, but I confess it was possibly that much too warm a day to be thoroughly convinced by this assertion. But the unanimous conclusion of the meal was that we resolved to return to partake of the breakfast menu, or to sample the winter menu, which is bound to be full of soups and roast toasty something or other, hmm mm….